Rewaaaaaaaaaaaaaards Points! Yup, you've been building them! If you've created an account on our website and have been placing orders with us, then that means you've been stock piling Rewards Points after every purchase. Yeeeaaaaaa baby!!! On the other hand, if you don't have an account with us and have been just checking out as a guest when you purchase from us, then you're just missing out on all of the savings that the "Cool People" get to take advantage of on all their purchases. We call them "Cool People" because they're savvy anglers that like to save money on all their PowerTeam gear. So if you don't have an account with us, we think it's about time you sharpen your noodle and hop on the same money saving train the "Cool People" ride on…unless of course you just don't like saving money (we call those types the "non-cool" people). Anyhow, now that the cut and dry facts of being a savvy shopper has been laid on the table for you, I'll focus my attention over to just the "Cool People" and give you the simple rundown of how the points work and how to cash them juicy points in. And it's oh so simple! Step 1: Just make sure you're logged into your account every time you order and you'll build points fast. Step 2: If you want to redeem those juicy points, just click on this yellow tab on the bottom left of our webpage. When you do, a magical pop up appears (okay, it's not really magical but it definitely makes it sound more exciting). On the pop up, you can see how many Rewards point's you've earned along with 4 different "Redeem" buttons for the amount of points you've acquired. Step 3: Just click on the Redeem button for the reward you choose and you will quickly be emailed a top secret code (again, not really top secret but those words keep that magical excitement rolling). Then when you're ready to order, just copy and paste that top secret code in the Order Confirmation screen during checkout where it states "Redeem a Gift Certificate or Coupon" and BOOM, you save $$$! Offer your friends a $5 off coupon on their next order and you will earn 250 points for the completed sale. Click the link Invite Friends & Earn Points, located in your rewards redemption pop up. Well there you have it. Welcome to world the "Cool People" live in! 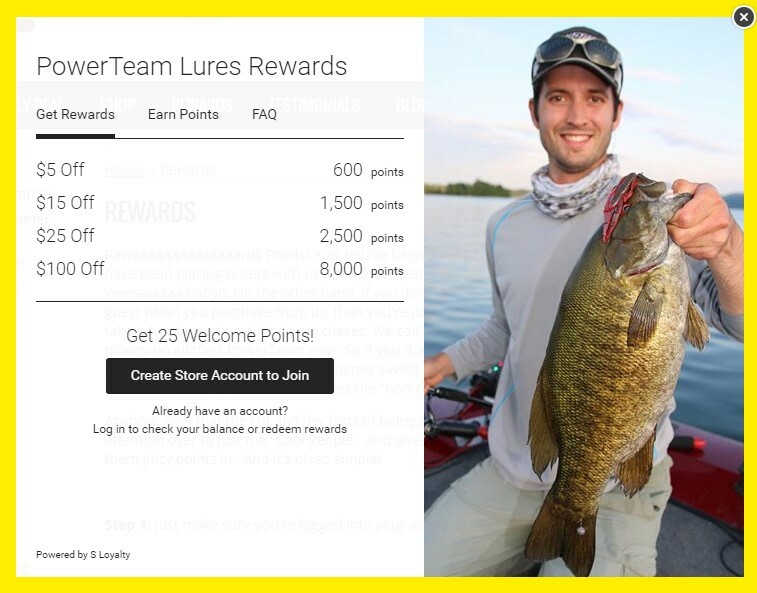 You earn, you cash in, you save, you catch more fish for your dollars!